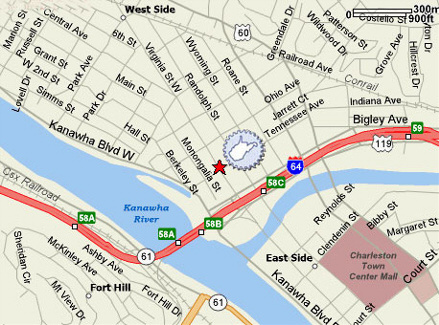 From I-77, I-79 and I-64 westbound, use the Washington Street Exit 58C. From I-64 eastbound, use the Virginia Street Exit 58B. Turn onto Randolph Street and go west two blocks to Ohio Avenue. Turn left onto Ohio Avenue and then either turn left into our lot or continue to Virginia Street West turn left and enter the front of our lot from Virginia Street West.